What’s God Will for Me? What is God’s will for my life? This has got to be one of the most asked questions for Christians. If not, it would have to be up there pretty high on the list. This is one of those questions that I have ask myself since I have had many struggles from the time I was little. It’s like we have the mentality of thinking that God’s will went missing in action. When it has really been there ever since we were born. There are a ton of self help books and all kinds of advice to help you understand what God’s will is for your life. With all the health problems and uncertainty in my life, I have had those who ask me what it is that keeps me going. It is as if they are asking about some magic potion when there is no potion, there is only God. The struggles are something that I have chosen not to focus on and I don’t think that God wants us to focus on all of those things that bring us down. When I think about God’s will, I believe that by doing God’s will, I should be trusting God and having faith that God is going to be there for me. That’s what I would call faith. It’s as if we have a bucket list kind of mentality when it comes to obeying God and knowing God’s will for our lives. It isn’t like there is a list of things to check off. Even though there have been times I have said that I want to make sure I keep myself in check and motivated for the right reasons when it comes to my walk with Christ. When we open ourselves up to God, study His word and be obedient then I am doing as God as guided me to do. When I let worldly things and my own emotions control my life, then my life becomes destructive for myself and for those around me. Each day is different and I have to take things a day at a time and sometimes an hour at a time, either way, God is in control and I choose to do His will. Jeremiah 29:11, “‘For I know the plans I have for you,’ declared the Lord, ‘plans to prosper you and not to harm you, plans to give you hope and a future’”. Those who have been following what has been going on with my family understands that Satan is at work. 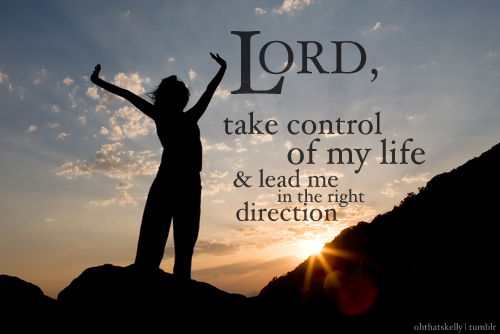 As for me, I refuse to let him (Satan) control things in my life, no matter what may come my way. When I consider the obstacles my mom has been dealing with that are physically and emotionally difficult to handle without God, I know that my relationship with God is the only option when it comes to peace, true happiness and hope. Isaiah 32:17, “The fruit of righteousness will be peace; the effect of righteousness will be quietness and confidence forever”. For me there is no choice since I already do my best to follow Christ. If we trust fully in God and have faith God can accomplish what needs to happen in our lives. In closing, I just want to say that in the Bible we are told that God’s will is to be worshiped. He wants us to listen, receive and love the gospel and to glorify Him. We are told in Matthew 4:19 to “Follow Me, and I will make you fishers of men.” In the days that followed, He taught them in Luke 19:10, that He “came to seek and to save what was lost,” and He told them that just as the Father had sent Him into the world, He would send them into the world. God’s will in the world is to save and bless His people. And as a follower of Christ, it is my responsibility and my choice to listen to God’s voice and to go where He sends me. Even if I don’t get it, which is a lot of the time, but I will go and share the gospel with those who need to hear it, which is the world and my parents. Next Prayers for Charleston S.C.